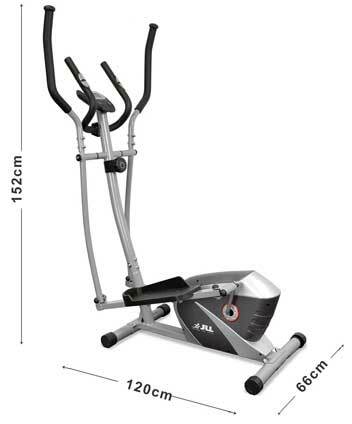 JLL’s CT200 is a home elliptical cross trainer that offers a 5KG, two-way flywheel and 8 magnetic resistance levels for users that want to push their body to the next level. This model is filled with great features and comes with ROHS CE GS compliance. It’s all about building up a sweat when trying to do cardio. The CT200 tones muscles while helping you burn calories in the process. This starts with the 5KG, two-way flywheel that runs smoothly, yet provides resistance when needed. The 8 magnetic resistances goes from easy to straining, with users having to push out every last bit of strength when on the highest resistance. The pedals are also very comfortable and able to accommodate most shoe sizes with ease. The only restriction I’ve noticed is that there is a 100KG maximum user weight allowed. For both weight loss and muscle toning, the CT200 excels. 8 smooth magnetic resistance levels. The middle console has all of the metrics needed to ensure that you’re pushing your limits and that you’ll see results. This starts off with the amount of calories burned during a session. Users that are calorie counting will want to note how many calories they burned during a workout. There are speed and distance values listed as well. Knowing the distance you have gone during the course of a workout is great for anyone trying to build stamina, and speed is ideal for anyone trying to push their limits and burn more calories in the process. The final metric displayed on the console is the user’s heart rate. When you’re using the elliptical, the handlebars will calculate your heart rate thanks to the heart rate sensors included on the handles. All of this information provides you with tangible data about your current workout session. Works for users of all heights. Assembly takes a little long. I was shocked by the time it took to assemble this model. Some users can take one hour for assembly, but others have taken up to three hours to assemble this model. It’s not too much of an issue, but it is something to note when purchasing the CT200. The JLL CT200 provides a low impact way to exercise while still burning immense calories and building muscle at the same time. A maximum user weight of 100KG allows most users to use this machine, and the resistance levels range from beginner to someone that is very fit, so you’ll be able to use this machine for years. Comfortable foot pedals allow for extended use while not feeling any foot pain. 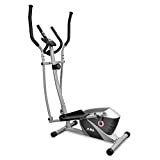 The JLL CT200 delivers on its promise of being an affordable, effective elliptical that will provide long-lasting results for users.